Kochi found a new hero in young attacker Suresh Khoiwal who started the final three sets and accumulated 11 points. 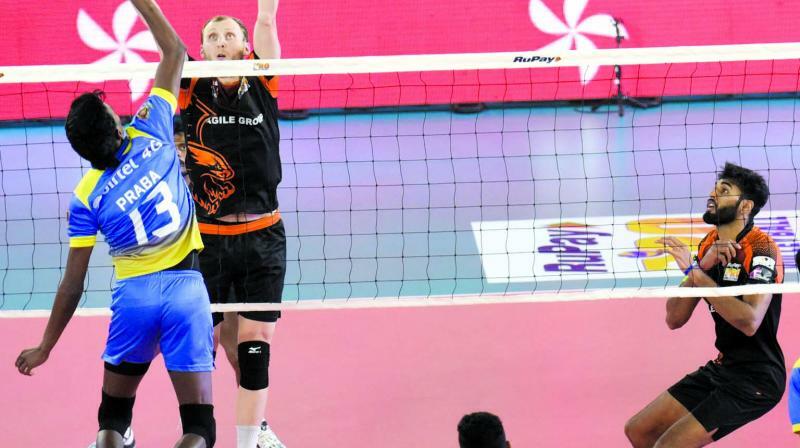 Kochi: Kochi Blue Spikers have inched closer to the semifinals of the Pro Volleyball League with a 3-2 (12-15, 15-11, 15-12, 15-10, 14-15) win against the Black Hawks Hyderabad at the Rajiv Gandhi Indoor Stadium here on Friday. The hosts survived an early scare as the Black Hawks secured the first set and so nearly crawled their way back in the second before surrendering a pair a super points that cost them the set. Hyderabad skipper Carson Clark who had been furious after his side went down 4-1 to Chennai on Thursday couldn’t be prouder of his boys who, despite losing consecutive games, are still in the race for the knockouts. “There is more positive than negatives for sure,” said Carson Clark, post-match. The American credited young blocker Ashwal Rai’s worth ethic and thought they were let down by “mental mistakes” because they are “young and inexperienced.” Ashwal topped the points chart with 15 points, including 11 spikes. Kochi found a new hero in young attacker Suresh Khoiwal who started the final three sets and accumulated 11 points. David Lee, who was given the man-of-the-match award for his 12 points, the joint-most for Kochi alongside Prabagaran, called upon young Suresh to receive it. Kochi captain Mohan Ukkrapandian wasn’t concerned that they conceded two sets in consecutive games as he stressed on the importance of picking up the wins and trying out new combinations during the league phase. “Today we tried all our players in the fifth set. Suresh came and changed the game. We need these substitutions so that we will be better prepared in the knockouts,” Kochi captain, said.